While the game play of Starwars Battlefront hasn\'t changed much form either of the console iterations, the scope of it has. The number of troops has been halved from around 150 to 75. Not to mention, the number of troops actually on the map is usually only 30 or so total for both sides. Now you might think this would work well for a handheld version, making the game shorter and sweeter, but it really just trashes every fun aspect of the game. Huge battles are gone. There are long sections where you don\'t fight. The action is nowhere near as heated and as fun as the regular (full) version. The PSP did add 3 “mini-game” modes: -Imperial Enforcer In this mode you must wipe out all of an indigenous people (Ewoks, Wookies, etc.) that you must wipe out within the time limit. Somewhat interesting, but not very new. -Rogue Assassin There are certain “marked” men in the battlefield that you must takedown in a certain time. Again, just another, shorter, variation. -Rebel Raider There are certain items that you must pickup and bring to a location on the map. It\'s somewhat interesting, being a sort of one player variation of capture the flag, but nothing really exciting. There is up to four player Ad-hoc multiplayer, but no online (infrastructure) so the best aspect of the game is lost. While being close to the console version, there are noticeable flaws in the graphics. The third-person view looks pretty bad, with sometime the character, or parts of it being see through. 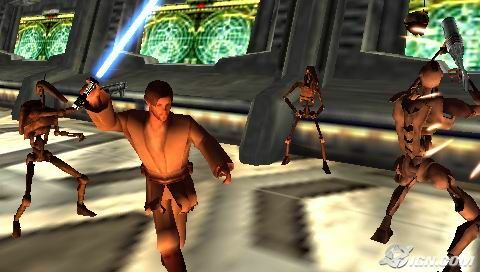 The first person mode looks good, but things like tanks and Jedi need to be in third person, so you can\'t avoid the inherent flaws in the third-person view. I love the Starwars music. The sound effects are spot on, and give a great sense of being in the Starwars universe. This is what has most disappointed me. Load times are awful, running 60 or more sec from turning on the PSP to playing a game. Also, after 10-15 hours of playing, my PSP crashed 5-6 times, 3 of which were “hard” crashes (where I had to physically remove the battery pack from my unit) No game should ever make the PSP have a “soft” crash, not to mention a “hard” crash. This is unacceptable. I was very disappointed in this game. While it\'s fun sometimes, it just has too many things that go wrong. It had the chance to be a great game, but failed in several ways.